Sharp Solar Energy Solutions and a group of its dealers recently donated solar materials and labor on a "solar build" in a neighborhood in New Orleans' Lower Ninth Ward, which was hard hit by Hurricane Katrina. The Sharp Solar Energy Solutions Group and a group of its dealers recently rolled up their sleeves and went to work with a "solar build" in New Orleans, installing solar panels on the homes of nine city residents and a community center. Working with local organizations and businesses, Sharp donated a total of ten 1.5 kilowatt solar electricity systems to homes and a community center in the Holy Cross Neighborhood in New Orleans. The neighborhood is in the city's Lower Ninth Ward, which was hit particularly hard by Hurricane Katrina and subsequent flooding. Reflecting the nature of the project and its location, the project was dubbed "SOLA' in NOLA." A group of Sharp authorized dealers donated their time for the project and installed the systems in early March. 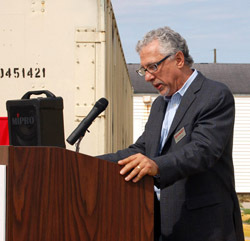 Sharp was assisted in selecting the houses by several locally based organizations that are working to rebuild the areas devastated by the effects of Hurricane Katrina. The systems will supply the homes with a lifetime of free, clean energy and provide an example of the power of solar electricity, said Ron Kenedi, vice president of Sharp Solar Energy Solutions Group. "As the U.S. solar market leader, we're proud to bring together our top customers to help rebuild the Katrina-damaged New Orleans neighborhood," added Kenedi. "All of us are here to show our support for the rebuilding effort in New Orleans--and for the chance to demonstrate that renewable energy, solar energy, is an important part of the 'new' New Orleans." Solar electricity, Sharp's Kenedi said, is now part of the mainstream energy solution, and a natural part of a rebuilding energy solution. "We could think of no place more appropriate than New Orleans to demonstrate the value of solar. "It's been a week that helped me remember why I got into solar power 25 years ago: to see technology positively affect people's lives," Kenedi added. "One of the homeowners who received a donated solar system told me that 'It's nice to use nature--instead of getting abused by it.'" 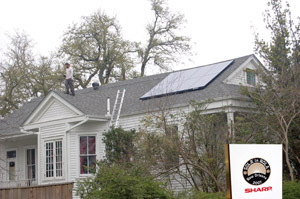 That homeowner, Bruce Harris, said that although the city has its share of overcast days, New Orleans is a natural for solar power with the amount of sunshine it receives. "I think these solar energy systems will work really well for all of us," he said. "I'm looking forward to getting some lower power bills for my home." Pam Dashiell, president of the Holy Cross Neighborhood Association, one of the local organizations Sharp worked with, said the company's solar build initiative "fits perfectly" with the broader sustainable direction they are working towards in planning the future of their community. "It jump starts our whole sustainability project," she said. "The Sharp solar project came just as we were opening the Lower Ninth Center for Sustainable Engagement and Development--the timing was great." The Holy Cross Neighborhood Association has been involved with the Lower Ninth Center for Sustainable Engagement and Development project since November 2005, and one of the project's goals is to help make the concept of sustainability a reality for residents. The project assists in providing energy efficient, sustainable materials to residents for rebuilding their homes. Sharp was assisted in the process of selecting the houses by locally based organizations--such as the Holy Cross Neighborhood Association--that are working to rebuild the areas devastated by the effects of Katrina. There was so much interest in having the panels installed that area residents entered their names into a lottery, with the installations going to the nine lucky winners. Jersey Solar, LLC of Lambertville, New Jersey was one of the dealers doing system installations and company president Rick Brooke said being involved with the project was very rewarding. Brooke said Sharp deserves a great deal of credit for organizing the solar build, and all the work that went on behind the scenes, such as permitting and coordinating the installation with local organizations. He hoped that other companies--and solar-related associations such as Solar Industries Association of America and PV Now--might view the Sharp solar build as a challenge, and take on their own solar builds. New Orleans was a very appropriate place to hold the solar build, he added, due to the damage left in the wake of Katrina. "There is so much rebuilding still to be done in New Orleans." Brooke noted that Jersey Solar has been involved with similar projects in its own area, donating the labor for the installation of solar panel systems for non-profits and churches. "We like to help out--we think it's important to give back to the community." The systems installed in New Orleans consisted of Sharp's all-in-one 1.5 kW Solar Racking Systems, which utilizes 187-watt ND-187U1 solar modules and includes mounting structure and an inverter. The system is designed for residential or light commercial systems. A total of about 80 modules were installed by Sharp's authorized contractors. Sharp Solar Energy Solutions Group is a division of Sharp Electronics Corporation and the U.S. arm of Sharp Corporation's solar electricity operations. With solar cell production of 710 megawatts worldwide--including a manufacturing facility in Memphis, Tennessee--and more than 200,000 installations a year, the company is one of the leaders in solar energy.